Legacy at Fallston Commons in Maryland offers residents the convenience of low-maintenance living. Set in Maryland’s popular Fallston area, Legacy at Fallston Commons is a new active adult community opened in 2012 by Ryan Homes. Upon completion, this intimate community will include 221 attached villa homes designed for residents age 55 or better. The community also boasts a beautifully appointed clubhouse where residents can enjoy social and recreational activities. With an eye toward luxury living, Legacy at Fallston Commons is being developed with spacious attached homes which include up to three bedrooms and two-car garages. Its collection of on-site amenities feature an inviting clubhouse and outdoor recreations. Yet homebuyers are also drawn to the community for its prime location. 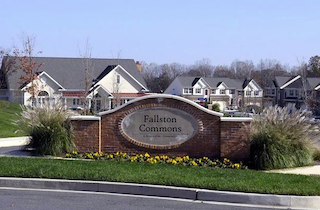 Legacy at Fallston Commons is within walking distance of several retail stores and is just minutes from nearby Bel Air’s picturesque Main Street. Legacy at Fallston Commons provides low-maintenance living with its thoughtfully designed homes and community services. Lawn care, landscaping and snow removal are all included as part of the homeowners’ association fees. This gives residents more time to pursue hobbies and spend time with their friends and families. The Legacy at Fallston Commons clubhouse welcomes residents with hobby and game rooms, a fitness center, multipurpose meeting rooms and various social areas. Special-interest groups and social clubs can often use the clubhouse for meetings, book discussions, card games and board games, hobbies and other community events. The outdoor recreations also include a swimming pool, tennis courts and a charming gazebo. Homes at Legacy at Fallston Commons are currently modeled on one floor plan, The Griffin Hall, which can be modified with a variety of structural and design options. The floor plan begins at 2,187 square feet, and can be built with two or three bedrooms, a minimum of two bathrooms and a two-car garage. The Griffin Hall is a two-story home design, yet it offers main-level living with a first-floor owner’s suite. This luxurious suite includes a large walk-in closet and master bathroom options for either an oversized shower or a standard shower with separate soaking tub. The main floor can also be modified with options such as an extension to the great room or a kitchen island. Upstairs, the home features an open loft space, a storage area and a full bathroom, as well as two smaller bedrooms or one large bedroom. To create even more living space, The Griffin Hall has a basement which can be finished with an optional recreation room, study and full or half-bathroom. Additional options throughout the home include fireplaces, columns and various design elements. Although homes at Legacy at Fallston Commons are based on one floor plan, the many options let homebuyers create the right home for their needs. Combined with the welcoming community clubhouse, these homes may be the perfect choice for active adult homebuyers who are looking for low-maintenance living in a prime Maryland location.